FRAMINGHAM, Mass., October 18, 2017 – Worldwide information and communications technology (ICT) spending is set to accelerate over the next five years, thanks to the growth of new technologies including the Internet of Things (IoT), robotics, augmented and virtual reality (AR/VR), and cognitive computing and artificial intelligence (AI). While the latest International Data Corporation (IDC) Worldwide Black Book forecasts traditional ICT spending to lag GDP growth by 2020, total ICT spending including these new categories will return to growth rates double that of the global economy. Total ICT spending on traditional IT, telecom services, and new technologies will grow from $4.3 trillion in 2016 to $5.6 trillion by 2021, representing a compound annual growth rate (CAGR) of 6% in constant currency terms. Annual growth will accelerate through the forecast period, from 5.5% in 2017 to 6.5% in 2021, as new technologies account for a growing proportion of the overall market. 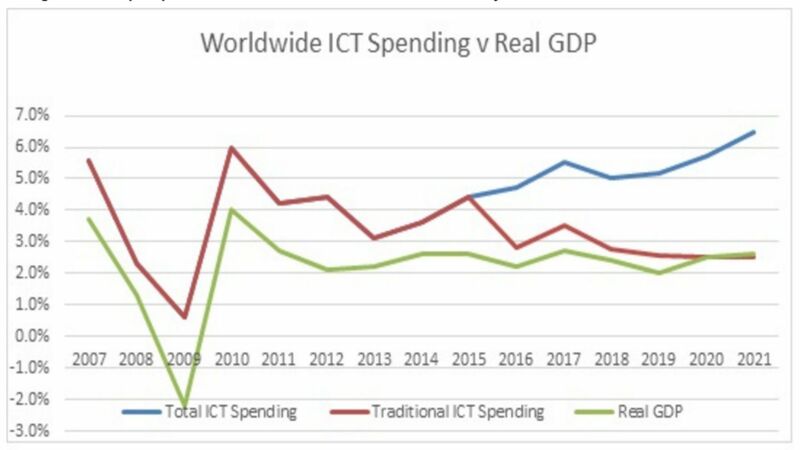 Traditional ICT spending (IT and telecom) is now a mature sector of the economy, as many technology markets continue to saturate and commoditize. The growth of cloud will also cannibalize from traditional ICT revenues, concentrating more IT capital spending into the hands of large cloud service providers. Traditional IT spending will grow at an annual rate of 3-4% through the next five years, while telecom spending increases by approximately 1% per year. New growth opportunities have meanwhile emerged in the new technologies which IDC calls "Innovation Accelerators" (IoT, cognitive AI, robotics, AR/VR, 3D printing, and next-gen security). New ICT spending from these categories will grow by 17% in 2017, and will continue to accelerate over the next five years as adoption levels surge around the world, including in emerging markets. IoT, robotics, and AR/VR in particular will come to represent a significant proportion of the overall ICT market by 2021. "The Innovation Accelerators are an important driver for the 3rd Platform, which is rapidly replacing the 2nd Platform of on-premise datacenters, devices, and software," said Stephen Minton, vice president in IDC's Customer Insights & Analysis group. "Not only does this introduce new high-growth categories like VR viewers, drones, 3D printers, and IoT solutions, but it also represents a growing shift in traditional categories like the growth of IoT servers or cognitive AI software." Several years ago, IDC identified a dramatic shift to the 3rd Platform of cloud, mobile, big data and analytics and social, which quickly came to dominate industry revenues. The Innovation Accelerators will drive the next wave of 3rd Platform growth, resulting in the 3rd Platform accounting for 75% of ICT spending by 2021. "The 2nd Platform is shrinking, but mature economies still have a large base of legacy infrastructure to maintain and migrate from," said Minton. "Emerging markets, on the other hand, are sometimes able to leapfrog 2nd Platform technologies and move straight to rapid adoption of new platforms. Asia/Pacific, for example, has emerged as a leading innovator in the growth of IoT and robotics, having already seen explosive growth in mobile over the past few years." While emerging markets like Asia/Pacific (excluding Japan) are driving the growth of some new categories, enterprises in the United States continue to be early adopters of software-based innovation, including cloud, big data and analytics, and cognitive AI. It will take longer for some emerging economies to reach the same level of software development and infrastructure that has enabled the rapid growth of cloud-based computing in the U.S. Nevertheless, the direction of ICT spending is the same in every region. "In the Central & Eastern Europe (CEE) region, most 2nd Platform technology categories are in decline," said Thomas Vavra, vice president of Software research in the CEMA region. "Conversely, and with the exception of a couple of mobile device categories, every technology on the 3rd Platform is growing strongly. In short, 3rd Platform investments are the growth engine of the IT market in the region." Like many emerging markets, CEE has lagged behind some mature economies when it comes to the adoption of technologies such as cloud, which are more dependent on fixed-line infrastructure, or in the development of cutting-edge software solutions for the local market. Asia/Pacific, for example, accounted for more than 50% of global IoT spending in 2016 but only 6% of investment in cognitive AI. In the longer term, however, the continued growth of investment in mobile infrastructure and software solutions will come to drive these regions to the next level of 3rd Platform innovation. "Mobility and IoT have already made a big impact on IT spending in the CEE region and will continue to grow strongly," said Vavra. "Although relatively small at present, AR/VR and cognitive AI are meanwhile expected to outgrow all other technology categories over the next few years." For additional information about the new IDC Worldwide Black Book or to arrange a one-on-one briefing with Stephen Minton, please contact Sarah Murray at 781-378-2674 or sarah@attunecommunications.com. Reports are available to qualified members of the media. For information on purchasing reports, contact insights@idc.com ; reporters should email sarah@attunecommunications.com. To learn more about IDC's Customer Insights & Analysis Group, please visit www.idc.com/customerinsights.